Dr. Roberts is a leading researcher on consumer behavior and the Ben H. Williams Professor of Marketing in the Hankamer School of Business at Baylor University in Waco, Texas. His book SHINY OBJECTS is available on Amazon. 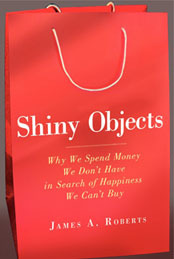 SHINY OBJECTS takes a careful and amusing look at how our love of material possessions impacts our happiness and what we can do to find true happiness in a culture awash in material possession love.